The pimples. The wet dreams. The cracking voice. With the possible exception of growing old, no other period of your life brings with it as many miseries as puberty, especially if you're Lockie Leonard. But Lockie is doing it extra tough: he's got a poetry-quoting cop for a dad, an infuriatingly sympathetic mum and a younger brother who still wets the bed. Not only that, the family has just moved from the city to the most isolated town on earth, the sleepy coastal outpost of Angelus, where their "new" house is steadily slipping into the local swamp. If this scenario sounds familiar, you must be a Tim Winton fan. About 17 years after Winton's Lockie Leonard trilogy was first published, they've finally made it to the small screen - with, as Lockie might say, some totally excellent results. "I think they have done a great job with it," says the Perth-based Winton. "I sat down and watched it with my three kids [aged 23, 18 and 16] and even though they are really too old for it, we all laughed our heads off, which is a good sign." The 26-episode series follows the Leonard family adapting to small-town life - the travails of the housebound mum (Briony Williams), the indefatigably optimistic dad (Rhys Muldoon) and the youngest bed-wetting son, Phillip (Corey McKernan). But it's Lockie who steals the show. Good-looking but gangly, smart but tongue-tied, the 12-and-three-quarter-year-old Lockie has an ironic turn that sees him able to negotiate most, but not all, of the challenges Angelus throws at him, from school bullies to a local girl whose "cuteness" quite literally strikes him dumb. The books are closely based on Winton's teenage years. Like Lockie, Winton was 13 years old when his policeman father was posted to a remote coastal town, taking the family with him. The Wintons went to Albany, a rough and tumble port town where, in a classic life-art parallel, the producers chose to film the series. "One day I went to visit the set, which was pretty funny," Winton says. "I saw some people I'd gone to school with back then; I saw all my old surf breaks; they even filmed the school scenes in the same school I went to - Albany Senior High School. I have so many miserable memories of it, too. You know, trying to fit in and feeling like you are always doing everything wrong." The series captures this admirably, with young actor Sean Keenan perfect as the straw-haired surf rat Lockie, out of his depth and paddling hard. "I was particularly impressed with the kids' acting," Winton says. "Everyone was really mature and disciplined. A lot of the cast and crew had to move to Albany - they had to bus in people for the crowd scenes. I thought the set would be pandemonium but I was really impressed. They were all six months older by the time they finished, which is a lot for a 13-year-old." Screen adaptations of much-loved books can be painful for authors (not to mention audiences) but Winton says he was happy to let the TV folk take control. "I was happy to let the writers do their thing; I was cool with that. I wasn't going to hang around like a ghost at a funeral." Trying to squeeze three books' worth of material into 26 episodes meant some narrative gymnastics - some "sticking new stuff in here and cutting out old stuff there," Winton says. "But overall the show has the same warm, humane decency about it as the books, which makes it watchable for people of all ages." Winton is less thrilled with the timeslot - weekdays at 4pm. "Having it on then really relegates it to the kids' slot," he says. "But it's really not just C-classification kiddie stuff. It's better than that." He says there is dire need for family TV - the kind of stuff everyone can watch together without the kids dying of embarrassment and the parents from boredom. "It's rare that everyone can gather around the telly and get misty-eyed together or have a laugh, so when it happens we should treasure it. In a sense, it's a shame that the network doesn't know what it's got." Oh, well. As surfer and noted philosopher Lockie Leonard once put it: "Sometimes life's just one long whack in the goolies." Lockie Leonard begins on Nine on Tuesday at 4pm. TIM Winton is one of our most celebrated writers, a prolific and award-winning author of enviably luscious words packed together to create grand tales such as Dirt Music, Cloudstreet and The Riders. But the thought of being too involved in making a TV adaptation of his works overwhelms him. "It's very hard to get these things off the ground," he says from his home in Fremantle, WA. "Every time I see people making TV or film I'm just grateful I write books. "I am my own banker in that sense, whereas these people have to go to so many different sources to get investment funds that it makes your head spin. I don't ask for script control either - I could have insisted on it, but what's the point? "By the time I finish writing a book I'm happy and done with it, and if someone can make a TV series from it they can do what they want." Well a production company has, adapting the Lockie Leonard trilogy of books which charts the uncomfortable adolescent years of a boy growing up in a remote coastal town in Western Australia. They have been popular since the first release in 1992 and have featured in several stage productions. The series, set in Albany (but called Angelus), brings the lively and thoughtful Lockie to life. It has a sense of direction which talks to, rather than at, those in their early teens. The story is loosely based on Winton's own experience when his policeman father was transferred to Albany for three years from 1973. "I was writing about the memory of being an adolescent and how awkward and self-conscious and weird you feel, where you just know whatever you do will be the wrong thing, that endless capacity for mucking up," he says. "But it's also happy memories of how much I did have growing up in a country town at age 13, 14 and 15. "It wasn't nostalgia because you don't feel nostalgic for having been embarrassed. It was a pretty mixed time as a teen, but by and large I was happy." The 26-episode series, starring Sean Keenan as Lockie, will be seen on Nine at 4pm three days a week, and Winton is impressed with it. "It's warm family TV," he says. "I sat down and watched all the episodes in two days and I forgot I was associated with it, which is a good indication. I watched with old people, nine-year-olds, 16-year-olds, and everyone engaged with it, so I was pretty happy. "It's just a shame it's on at 4pm and not 7pm on a Sunday, where the family could sit down and watch it and have a laugh, because there are strands of irony and humour there that resonate with adults." The series was filmed in Albany and Winton says memories and the feelings that went with them bubbled up. "I was leaping off the couch saying, 'That's Mutton Bird, I used to surf there'." he says. "They even shot in the school where I was a school kid, and that gave me a bit of a complicated thrill. There's nothing straightforward when you remember school." Lockie Leonard the 26 part family series from production company Essential Viewing has been doing brisk business at the recent television market in Cannes. With sales announced to Rainbow Media in the USA, France 2, Netherlands Public Broadcasting, Belgium's VRT and Nickelodeon Italy, the witty and heartfelt comedy has been winning hearts around the world. Sophie Gigon, Head of Acquisitions at France 2 who bought series said 'This is one of the most pertinent and funny series I have seen in years'. Based on Tim Winton's multi award winning Lockie books - Human Torpedo, Scumbuster and Legend - Lockie Leonard tells the story of 13 year old Lockie and his loving, but eccentric family as they struggle to fit into the small coastal town of Angelus. Produced by Essential Viewings Kylie du Fresne, the series was launched last night on Jetix UK in the prime time slot of 6pm and will premiere in Australia on the Nine Network Australia later in the year. Down under, the cast are signed and cameras are rolling on a new children's television series destined to air on Australia's Nine Network, Nickelodeon Australia and Jetix UK in 2008. Produced by Kylie du Fresne from Stepfather Of The Bride indie Essential Viewing and directed by Tony Tilse (Go Big, Farscape), Lockie Leonard (26x30') is a story about a 12-year-old 'surf rat' whose family has just moved to the most remote town in Australia. In his TV debut, Sean Keenan has been signed to play the title role, while another newcomer Corey McKernan, Rhys Muldoon (McLeod's Daughters), Briony Williams (All Saints, Blue Heelers), Gracie Gilbert (Streetsmartz) and Clarence Ryan also star. The series is being adapted from Booker-nominated writer Tim Winton's novels of the same name, which are published by Simon & Schuster and have been on the Australian school curriculum for over 10 years. As well as the three networks, finance for the show has come from the Australian Children's TV Foundation, FFC Australia, Screen West, SAFC, IDM, Sony ATV and Sony Home Pictures Entertainment, which has home entertainment rights. 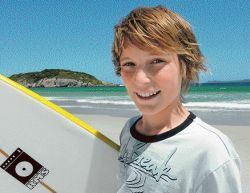 A 13-YEAR-OLD Busselton boy with no acting experience has won the coveted role of Lockie Leonard in the television adaptation of Tim Winton's popular children's books. Sean Keenan, a self-confessed "surf rat" like his rambunctious character, beat thousands of young hopefuls throughout WA and Australia to play Winton's hero in the 26-part children's drama, which begins shooting in Albany next week. "It's really exciting," Sean said from the set, where he was busy rehearsing. "Nothing like this has happened to me before. It's huge. It came out of the blue." Sean was nominated to represent Busselton Primary School when casting agents began their search for Lockie in South-West schools. "I really enjoyed the books. I read all before the first audition, so I had a good idea of the character. I reckon he's a great guy," Sean said. Just as Winton's Lockie Leonard novels are inspired by the author's childhood move to Albany, Sean has moved to the town with his family for the three-month shoot. "We live about 10 minutes from the beach, which is great," he said. "We went and saw the house Tim Winton lived in, and some of the actual characters from the books still live here in Albany, so that's cool." Sean said the best thing about winning the role was that he wouldn't have to start high school until fourth term. "I think he's going to make a fantastic Lockie Leonard," said casting director Jenni Cohen, who was taken by Sean's sheer likability. "He just came across as a really nice kid who you would want to be your friend if you were a kid. "He stood out in that he had a maturity and confidence about him that was very appealing without being over confident. "It's going to be an amazing experience for him." The series will screen on Channel 9 later this year. The Film Finance Corporation has approved financing of a new 26 by half hour children's series, Lockie Leonard, which the ACTF will distribute internationally. Produced by NSW based Essential Viewing, the series is based upon the novels by Western Australian, Booker nominated author, Tim Winton. Twelve and 3/4   year old Lockie Leonard is a surf rat and when his family move to the most remote town on Earth, Angelus, Lockie's convinced that this is a total disaster - no friends, a new school and a house that is truly in danger of disappearing into a swamp. But then Lockie spots the one thing that makes it all okay. This weird little town has the best surf he has ever seen. ACTF CEO Jenny Buckland says "It is terrific that the ACTF, through our distribution advance, is able to help independent producers like Essential Viewing. There are not many boy skewed live action drama series, which makes Lockie Leonard stand out. The scripts are great fun and the location in the south of Western Australia is visually exciting." Producer Kylie du Fresne said, "Lockie Leonard is a fantastic story by one of Australia's great authors. Through his successful books, Lockie Leonard has already entertained thousands of children around the world. We wanted to work with a distributor who really understood innovative children's television, both from a distributor's point of view and also as producers in their own right. We look forward to Lockie Leonard delivering a high standard of funny, entertaining and exciting Australian television. The series will be shot in Western Australia and post produced in South Australia. Lockie Leonard has been pre sold to the Nine Network. Other partners include Nickelodeon Australia, Jetix UK, ScreenWest, South Australian Film Corporation and IDM.